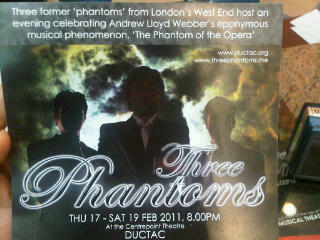 The Three Phantoms is playing for 3 nights, starting tonight, at the Mall of Emirates Theatre. The show will have three of the actors that played the role of the Phantom, plus the actress that played the lead lady for 2 years. And I also just found out that all actors are staying at my hotel, so I’m crossing my fingers and hoping to see them there later. The show is running for 3 nights, and will end on Sat Feb 19. Tickets are from Dh 120 to Dh 250.
that is a gr8 show!!! wow!!! E7na VIP tickets 3ala Dh250, la w tara ako stalls and balconies from Dh100. Check my blog for a previous post about the iceskating rink magic show, which I personally though was really expensive. And now look at tonight’s plays, they have brought 4 original westend actors and actresses, whom have worked in a play that 100 million people watched. And all we paid was kd 20! !